If your mom or dad has been diagnosed with Alzheimer’s disease, you probably have many questions about what to expect and how to give them the best care. The type of care your loved one needs likely will depend on whether they are dealing with early, middle, or late-stage Alzheimer’s. At each stage, seniors with Alzheimer’s experience different challenges and changes in their ability to live independently. 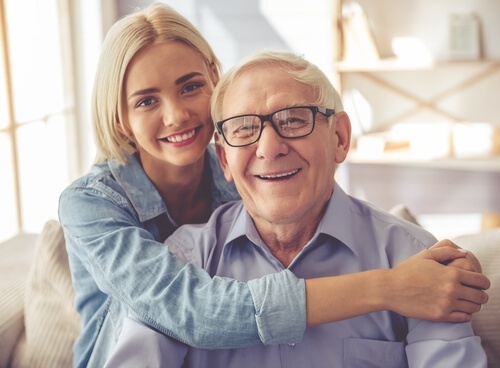 Home care offers your loved one the customized, compassionate care they need to remain healthy and safe while still allowing them to live at home in familiar surroundings, which can reduce feelings of distress in Alzheimer’s patients. For many families, however, the cost of home care can raise concerns about how to pay. Your loved one deserves the very best of care, and your family deserves to have confidence and peace of mind about that care without the added stress of cost concerns. There are three primary ways you can approach the cost of home care for Alzheimer’s disease. Let’s take a look at each one more closely. Home care can be customized to the needs of your family. One way to minimize cost is to use home care as a supplement to care provided by family members. For example, family members may alternate care responsibilities on the weekend and use home care during the week. Another option is that one family member may be able to act as the primary caregiver and utilize respite care to step in during periods of time when they can’t be available. As Alzheimer’s disease progresses, however, your mom or dad’s needs may exceed the family’s ability to provide care. If that’s the case, it may be time to adjust your care plan and consider additional ways to cover the cost. Veterans’ Benefits—With the recommendation of a doctor, veterans may be able to receive assistance from the Veterans Aid and Attendance Pension. Medicaid—This joint federal and state program helps low-income families pay for health care services including home care. Assistance availability is based on individual circumstances and financial need. Tax Credits—Talk to your mom or dad’s accountant about any tax credits that may be available to you. These credits can reduce your overall tax burden and free up resources to help pay for home care. Golden Buckeye Program—While not technically a financial assistance program, the Golden Buckeye Program provides discounts on many products and services for seniors living in Ohio. It may help you reduce the cost of prescriptions and other needs as you consider your options. Western Reserve Area Agency on Aging—You can contact the agency about programs that they have available. They often have programs or grants to cover respite care for loved ones. Asset Conversion—Equity in your mom or dad’s home or other assets can be accessed using asset conversion plans such as a reverse mortgage. Annuity Loan—If your loved one has an annuity, an annuity loan may be a good option for you. Long-Term Care Insurance—Long-term care insurance helps you plan ahead before your family member faces age-related care needs. It can be used for home care and respite care in the event that your loved one develops Alzheimer’s or other health needs as they age. The most important thing to remember as you consider your options is that affordable care is possible. By assessing your options and taking advantage of assistance opportunities available to you, you can give your senior loved one the gift of quality care in the home environment while also ensuring peace of mind for yourself and your family. If you have more questions about covering the cost of Alzheimer’s Care in Ohio, download our free resource, Ways to Pay for Home Care.